Anyone following the current state of the Australian ski season would be dismayed. We had a great early season fall in May which was unfortunately washed away by heavy run just a couple of weeks later. In the time since, the season has coughed along with the odd dusting and small snowfall. The resorts have been all but unskiable; crazy crowds, restricted terrain and icey manmade snow. Finally having a free Sunday I took the opportunity to head out to the backcountry to see what was going on. I also recently purchased a GPS unit (Garmin MAP 62s) and was keen to log some way points and muck around navigating with it. I paid my $33 for a one way ride up the Kosciuszko Express from Thredbo Village. It was a beautiful sunny day. However, the snow conditions were terrible, ice and hoar frost. I made my way along the Kosciuszko trail until I hit the Ramshead ridge line. I dropped down to Cootapatamba Hut. A few hundred metres of icey turns. It was great to finally make it to the hut in winter. From the hut, I climbed the southern ridge of Mt Kosciuszko, around 200 vertical metres. Arriving at the summit I was shocked to come across two guys dressed in jeans and sneakers! Seems they had walked all the way from Thredbo. I had lunch and a cup of tea at the summit cairn enjoying the view. I took some more icey turns to Rawsons Pass then continued on to Seamans Hut. Another cup of tea and some chocolate and it was time to start the ski back to Thredbo. Nice view form the hut! I have to be honest, the ski from Seamans Hut to Thredbo is actually pretty boring. The challenge of maintaining purchase on the ice was also pretty tedious. I stopped for a quick break and ate another chocolate which pepped me up a bit. I eventually came upon Antons T-bar at Thredbo but my day was not over yet. Did I mention how icey it was? Well yes, it was even icier back in the resort! The ski down the not yet open Antons felt like life and death. A semi controlled side slip down sheet ice with the odd post hole back to bare earth thrown in. When I finally made it back to the open part of the resort, High Noon, things didn't get much better. After spending the day in peaceful silence I was accosted by the school holiday crowds seemingly focused on the only skiable part of the run. To my shame, where I would normally carve some high speed turns, my tired legs and the relentless ice meant I mainly side slipped to the bottom. Despite the ice it was a great day out. 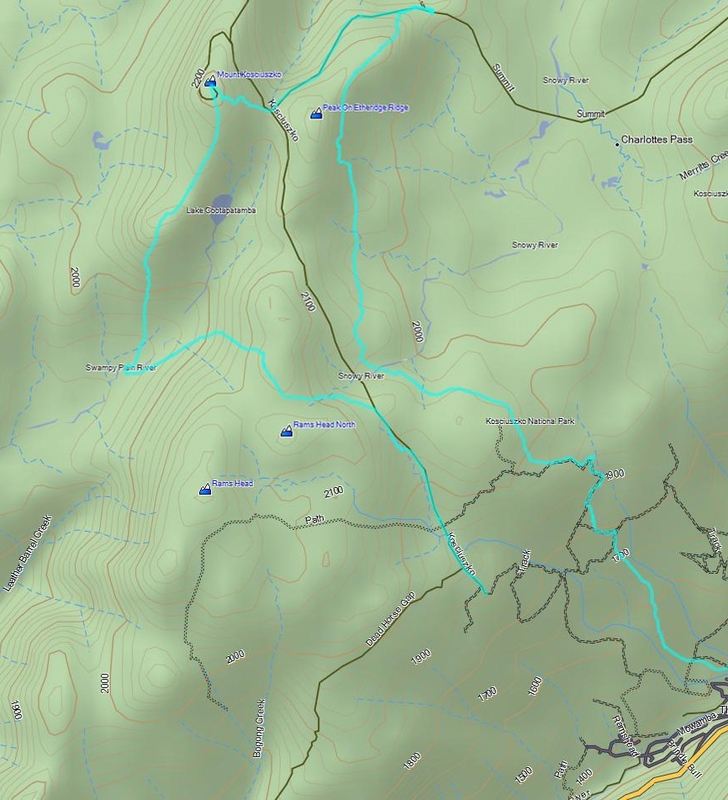 I covered close to 20km and managed to log some of the key huts and features of the Ramshead and Kosci part of the Main Range on my GPS. I also coupled the unit with the Garmin heart rate monitor and got my HR to 170 with an average of 110. No wonder I was buggered, after my summer slothfulness I'm surprised I didn't have a heart attack! We are currently experiencing our first big snowfall for the season. Hopefully my next BC adventure will entail powder and not ice!